Have you ever used Weeny Free Video Cutter to cut large video files? What do you think of it? Is there any problems that occur again and again and finally make you upset? Are you going to abandon this video splitter and looking for a good alternative? If so, maybe the post here would give you a hand. Before we introduce these five best alternatives to Weeny Free Video Cutter, let’s have a look at what exactly Weeny Free Video Cutter is. Weeny Free Video Cutter is a freeware that can be used to trim and cut large video files into smaller parts; remove the unwanted parts off the original video such as commercial ads or trailers. The video cutter software supports many different video and audio files, including 3GP, AVI, MP4, MPG, WMA and more. Besides, users can also customize the videos, for instance, change the order of video clips, adjust the output settings and give a new name to the output video. The advantages of Weeny Free Video Cutter are obvious. It is 100% free downloading and free to use as well. You can finish the video cutting with just a couple of clicks. However, the tool also has some weaknesses. For example, there is no additional splitting method provided. Some control key is not good to use, you can’t use the slider to set the time accurately. The quality of the video may be damaged during the cutting and conversion. For that reasons, some people may don’t like Weeny Free Video Cutter and want to seek for good replacement for it. Thus we here introduce five best alternatives to Weeny Free Video Cutter for your reference. 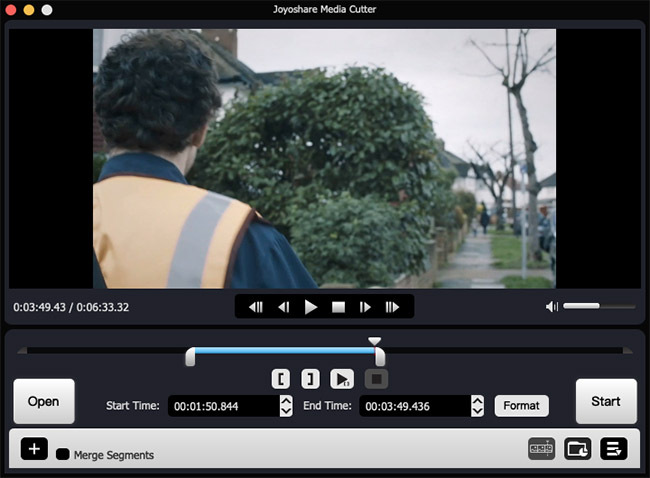 Joyoshare Media Cutter for Mac (or Joyoshare Media Cutter for Windows) is one of the best Weeny Free Video Cutter alternatives. This is a powerful video cutting tool meant for users who want to trim big audio and video files without any quality loss in order to upload them to YouTube, Vimeo or Facebook or for other uses. 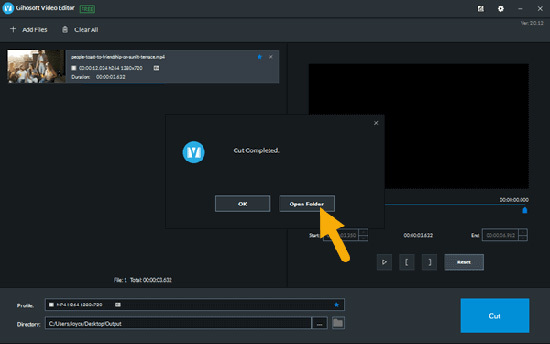 Joyoshare Video Cutter can crop video and audio files from H.264, MP4, M4V, AVI, MP4, MPG, 3GP, 3G2, WMV, ASF, RM, RMVB, DAT, MOV, FLV, MKV, MPEG and more to ASF, MOV, M4V, MP4, WMV, MKV, AVI, MP3, FLAC or AIFF files, etc. In addition, it also supports tons of output mobile devices, including Apple iOS gadgets, Samsung Galaxy series, game controls like Xbox and PS4, smart TVs and so on. With intuitive interface, Joyoshare Video Trimmer is very easy to use. You can cut large videos/audios into smaller pieces, remove useless parts away, and extract audio from video files, etc in just a few clicks. Moreover, the cutting and conversion process is very faster, you only need to wait for a couple of minutes. This is another free video splitter as its name suggests. The program is focused on cutting videos. You can cut and split big HD videos into many small clips as you like with good video quality. The video clipper works with several popular video file formats, including AVI, WMV, MOV, MPEG 1/2, MPEG4, DivX, Xvid, Flash video and so on. Free Video Cutter is only compatible with Windows system. It is clean and secure, without any spyware or adware. And it is very easy to use, anyone can do the cutting, no need any professional knowledge of it. Gihosoft Free Video Cutter is a good alternative to Weeny Free Video Cutter. It is also a freeware that is dedicated to cutting large and long videos into shorter segments without causing any quality damage. It is compatible with Windows 10/8.1/8/7/Vista/XP and 2000 operating systems. The program supports multiple video formats including MP4, AVI, MPEG, MPG, VOB, WMV, 3GP, MOV and more, so you can get what you want as you like. When you run the software, a quick user guide will come up and tell you how to cut videos. That would be so good. Another best Weeny Free Video Cutter alternative is Bandicut Video Cutter for Windows. Bandicut is an easy-to-use and fast video cutter and joiner. Besides splitting the video into multiple files, you can also remove some parts from the video, merge the video clips you cut, and extract audio from the video to MP3, etc. Bandicut Video Cutter supports various video file formats including MP4, AVI, MOV, MKV, M4V, MPEG, MPG, DAT, VOB, etc. It provides two cutting methods, namely, high-speed mode and encoding mode. The former allows you to crop the video fast and losslessly while if you choose the latter one, you can change the codes, quality and resolution of the video. Xilisoft Video Cutter for Windows (Xilisoft Video Cutter for Mac) is one of the easiest video cutter software in the market now. With Xilisoft, everyone can be a video editor to make and create wonderful videos and then share them with families and friends. The video trimmer supports a wide range of video file formats, such as AVI, WMV, MP4, MOV, FLV, MKV, MPEG, H.264/MPEG-4, DivX, XviD, 3GP, RMVB, ASF, DVH.264/MPEG-4 AVC, MPEG2 HD Video and more. With friendly interface and fast conversion speed, you can cut the videos within only a few minutes. These five alternatives to Weeny Free Video Cutter have been well explained in the article and each has its own pros and cons. If you’re fed up with free video trimmers and looking for paid ones, you can go for Joyoshare Media Cutter which is capable of preserving a good original video quality. But if you still want a freeware, just try other replacement like Gihosoft and Free Video Cutter.